I have always tried to find the exact English translation for this French expression, yet I never came close to what it really means in French. Péché is a sin, and mignon means cute. Yes yes, that exact same word you use if you said of a girl, a baby, a cat, your hubbie she is cute! (elle est mignonne!) So you could simply say cute sin. How would you like to be the victim of a cute sin? Do we think that such things exist? Mais que oui, when it comes to food, tout est possible! (everything is possible!) Eating too much of one thing is a sin? No no, it is a cute sin, un péché mignon! In other words, when you have a péché mignon, this means that you cannot resist that particular devilish food and just indulge in it. I would say, because I love chocolate and cannot resist it, it is my péché mignon, my weakness so to speak. And I know we all have a péché mignon! If you told me you don’t, well, I don’t think I would believe it. We are not angels, and a sin like this is fully forgiven! Mon chocolat à moi ! Mousse au chocolat is such a classic dessert that I just do not think there is any need for me to introduce this dish to you. Every country, every chef, every family probably has a favorite recipe and memories attached to it. 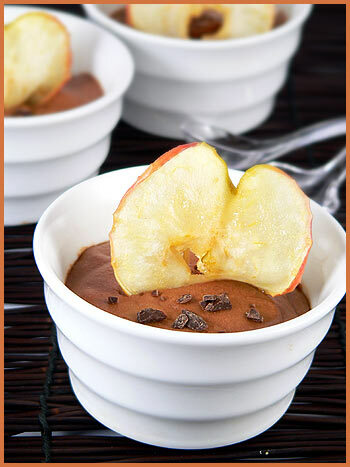 Can you live without mousse au chocolat? Of course you can if you just do not like chocolate, but if you do, just like I do, mousse au chocolat is just like bringing sunshine in your body! It feels so good! Every mouthful is slowly appreciated. I actually love to eat it very very slowly! 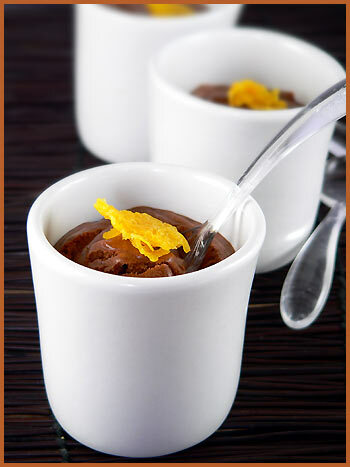 Mousse, in French, means “foam“, hence the idea that the preparation is light. The use of white eggs is definitely helping to create this texture. 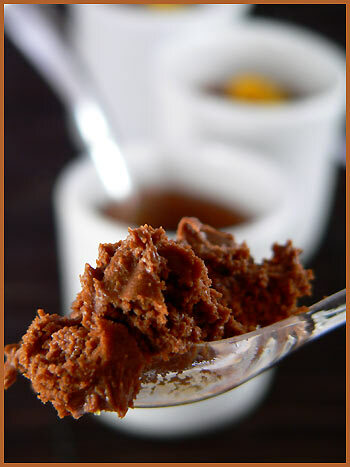 How easy is it to make mousse au chocolat? Pretty easy as a matter of fact. It all depends on what you like. I have tried many many recipes, from Pierre Hermé’s Mousse au chocolat au lait citron/gingembre (milk chocolate with ginger and lemon) (from Plaisirs sucrés) to my mum’s until I settled for those two I am going to suggest here, one with egg yolks, one without. You choose! There are hybrids of many that exist. No matter what your choice settles on, it is essential that you pay close attention to the choice of chocolate. When a chocolate does not melt easily, it is frustrating and gives very poor results. In French, the chocolate we use is called chocolat de couverture. 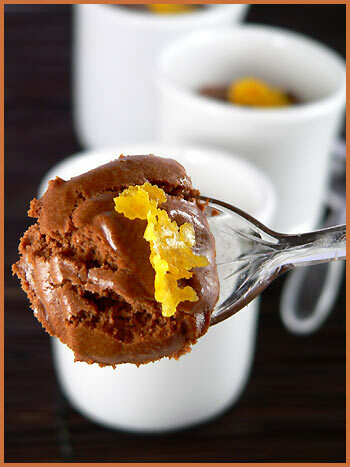 I am a fan of Valrhona‘s dark chocolate for my cooked desserts, and for these recipes, I used Manjari 64% cocoa. 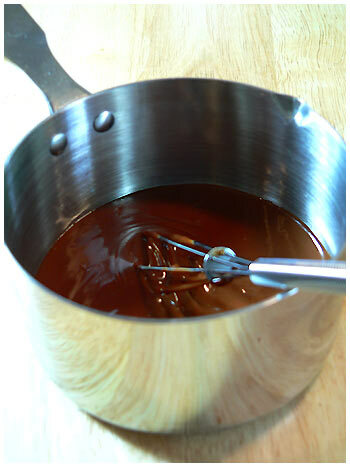 Melt your chocolate using the bain-marie technique. Heat the cream until boiling. Add the cream to the melted chocolate and mix well together. It should thicken. Beat your egg whites firm. Before they are fully firm, gradually add the sugar and continue to mix. Then very carefully, add the egg whites to the preparation, making sure you do not “break” the eggs. Use a wooden spoon to describe those large circular movements. Place in individual cups or a large bowl. Serve with slices of apples broiled, on which you sprinkle brown sugar. Melt the chocolate and butter using the bain-marie technique (see above). When the preparation is not as warm, add the egg yolks, one by one and mix well. Beat your egg whites and gradually add the sugar. Add the egg whites to the preparation (see above). Place in individual cups or a big bowl and chill for at least 2 to 3 hours. There are good excuses to be sinful! And I personally preferred the one without the egg yolks, but I often change my mind, it all depends on my food mood! Oh, I love you, Bea! Chocolate – my favourite sin! Beats all other sins hands down! Amazing pictures as usual. I don’t know why but I prefer recipes without eggs yolks. Amazing ! What kind of camera do you use Béa ? Les gros plans sont toujours si difficiles à prendre! now, if you’ll excuse me, i have some sinning to do…. I will send you a plane ticket. You come to Toronto. You come to my house. And you make all of them for my family and I. Then we all sit and eat chocolate all night and drink espresso and talk about all our cookbooks. Bea, let me start by saying I concur wholeheartedly with Ivonne. The technique was devised by Hervé This, one of the fathers of French molecular gastronomy. I’d tell you more about it myself, but I just bought his book today, so I haven’t had a chance to investigate. Perhaps you’d like to give it a try? By the way, if you’re looking for ways to use more of your pink peppercorns, I know many people consider dark chocolate and pink pepper to be an excellent flavour pairing. I have seen dark chocolate and pink pepper bars for sale in Toronto, in fact. Bon Bea, t’est vraiment terrible! ahhhh tu nous don (not sure of the spelling) l’envie. Mouthwatering pictures.. ayayayyy! I love Mousse au chocolat Bea.. I learn English & French, and you a little bit of Italian!! wow…….those photos are just beautiful, Bea. Superbes photos comme d’habitude, mais je me repete la, je ne voudrais pas mettre la meme chose a chaque fois. Et bel effort de traduction du peche mignon, bravo. i feel there is an english idiom for ‘peche mignon’; perhaps ‘weakness’? as in chocolate addiction is my weakness? i am so glad you have taken on a classic. sometimes i need direction as to which classic recipe is best. thank you! oh! I can feel your food passion threw your words and recipes. Feels great. I can’t believe I just bump-into your stream on flickr. I have this cookin’ crisis for over 2 months – no inspiration, so this will be great cure for me. mmmm…. thank you for being here! je fonds comme ton chocolat. Tes cuillères sont en verre ? And i agree with you—the manjari is delicious! Merci Fabienne. Yes a true passion for chocolate and I would cover miles to find some. Linda, ahah, well the eggs just need tobe extra fresh! MM, ahah, so what does he look like? Pascale, merci beaucoup. I tend to agree with you, I prefer the one without the egg yolks. Lighter. Papilles, my camera is a Panasonic Lumix DMC-FZ20. Ivonne and Rob! 😉 well, you are tempting me. In exchange though, I want to sample some of YOUR things!! and Rob, thanks for the great tips. I should try this new chocolate technique. Have you? AH nice Sandra, keep going like this. It will be fun! Rekha, ah mais oui, tu as sans doute raison! Muskva, thanks for your sweet note. I once tried 99% but I thought, wow, that is a lot! Yes 80% is good for me too! Vanessa, thanks a lot for stoping by. It reminds you of your chocolate shot in a way, which I loved! Beaux contenants et contenus que j’aimerais bien goûter là tout de suite! Ah! c’est pas possible ? Quel dommage! Bea, thank you very “Big” for the correction ..(smile)! You are very “gentille”! Can you tell me the main difference between the one with the whites and the one with the yolks? taste? texture? I want to make this! Glad you are enjoying the mousse au chocolat. The one with egg yolks is richer than the one without. Also darker for deeper chocolate flavor. If you are for a lighter version, I would go for the one without the egg yolks. As to the egg beater, well, as long as you can get your egg whites firm without one. I am not sure. How do you do it usually without an egg beater? By hand? If so, it requires a lot of arm work, no? In any case, an egg beater is not too costy! I think you can transalte péché mignon to something like “guilty pleasure.” Like, something that you know is bad but it has its perks! Great photos, absolutely gorgeous! Wonderful site, wonderful recipes, wonderful pictures! Cheers, Bea! What is the amount of chocolate and other materials i require if i’m making this for 20 persons?? Bonjour, Bea! Merci for these two delicious recipes. I will have to remember “mon peche mignon” because I have a lot of them! I was thinking the closest English translation would probably be “my guilty pleasure,” a common phrase for things we love to enjoy that might not be so physically or morally healthy for us! mon peche mignon is a translation reffering to the term of something being “sinfully sweet”, so yes the closest term would be “my guilty pleasure” in english as kate said. 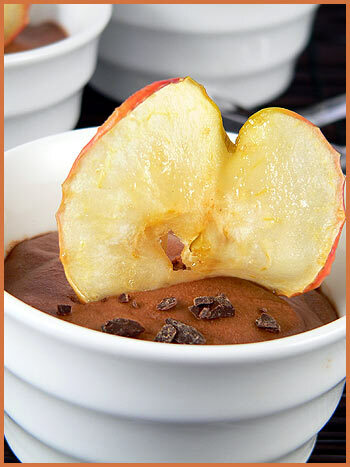 Great idea to add apples, especially as I didn’t have enough chocolate to make enough mousse for four people. I melted butter in the pan and added ground cloves and ginger (instead of the expected cinnamon), let it get hot and then roasted the apples on low flame. Then I sprinkled chocolate flakes on top. recipe for moussa a chocolat! During the melting of the chocolate add a little bit freshly brewed coffee (real coffee, no instant) and it will, for my ‘goût’, improve the taste of chocolate. Thats the way I do it and my family and my friends love it. mon péché mignon => means my sweet sin. I have been looking for this site forever! I stubbled upon it last year and made your Mousse #2 for my Buche de Noel last year and it was the best mousse I’ve ever had! Now I’m going back to make the Buche and couldn’t find your recipe! So glad I finally found it! Marvelous recipe! Our favorite now!